Japan has Ikea, which is good news for those who like the struggle of constructing their own furniture. I put a bed together yesterday... the less said about that the better. Japan's 5 stores are located around the Tokyo (Chiba, Yokohama, Saitama) and Osaka (Osaka, Kobe) areas, with more locations surely in development (Fukuoka is being unpacked as I type). It also has an English-language website with extensive catalogue. One of the things I really like about Ikea Japan is how they have managed to stay Scandinavian, but still work around the Japanese style of home. The demonstration 1DK apartments etc. in store offer some great ideas for making things look and feel bigger. Another great aspect is that many staff have excellent English. I don't know if this is a pre-requisite or not, but everyone I have dealt with has been able to assist in English if necessary. All receipts/documentation can also be printed in English. Home delivery is cheaply available to closely surrounding prefectures (starting from 990yen), but if you live further away be prepared to pay a little more, depending on the weight. This needs to be finalised on site, but if your Japanese is up to scratch and you know the combined weight of your items, you can check the delivery rate here. Don't be put off by the brochures that only show certain prefectures for delivery - they will deliver anywhere. Okay, so putting together the flat-packed furniture isn't that hard, it just takes ages and can be hampered by confusing instructions. If that's too daunting, you can also pay Ikea (20% of the price or 3000yen, whichever is more) to put it together when they deliver. They also offer an impressive kitchen design and installation service. Walking around the kitchen section will surely bring even the most hardened ex-pat to their knees, desperately flinging money from their pockets and crying. Ikea Japan currently has no form of internet shopping, so if you have no way of getting to a store you may be out of luck. 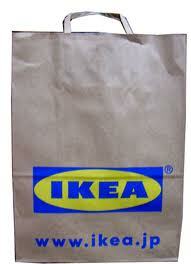 However, for a significant fee, YoYoMarket will go to Ikea, buy and deliver your goods. If money isn't an issue, or if you really, really want that shipment of Ikea snakes to Hokkaido, there's your solution. Don't forget the obscenely cheap hot dogs and ice-cream at the Bistro. In another life, I was one of those people bunning the dogs and squirting the ice-creams. Give them a big smile.